In 1863 the town of Truckee did not exist. In fact, all that was visible along the banks of the Truckee River were rocks and virgin forest—except for one solitary log house built by pioneer Joseph Gray. Native Americans roamed this Sierra region. A small white settlement near the head of Donner Lake served the many coaches and their teamsters and passengers who passed daily along the Dutch Flat-Donner Lake Wagon Road, enroute to Virginia City and the luring Comstock Lode. Joseph Gray believed that this area would be a good place for a tavern and way station for weary travelers. It was near this spot that transportation routes converged—the Henness Pass route from the upper North Fork of the Yuba, and the Dutch Flat-Donner Lake turnpike. Five years hence the Central Pacific would choose the same area as the focal point for its mountain operations. Constructed of native tamarack and lodgepole pine in about 1858, Gray’s cabin was located at today’s southwest corner of Jibboom and Bridge Streets. Experts have examined the 24’x20’ building and noticed no evidence of any kind of saw used to build the structure. The timbers had all been hewn with axes into the shape of a house. Initially, the small cabin sat alone beside the only road, and it was here that Gray ran a frontier hostelry, which served weary travelers arriving on the six-horse Concords of the California Stage Company. Twenty- and thirty-horse freight wagons rolled past the cabin day and night. Gray’s establishment was a place where travelers and teamsters could rest and enjoy all the comforts and hospitality of a friendly roadside inn, purchase supplies, and obtain directions or information. Joseph Henry Gray was born in 1826 in Middleton County, Durham, England. He was the son of Thomas and Ann Gray who emigrated to Tumockwa, Pennsylvania in the late 1820s. In 1833 the family, including Joseph and his nine brothers and sisters, moved to Dubuque, Iowa, “the heart of the Indian country.” In 1834 the family again moved, this time to Galina, Illinois, where they settled and farmed. Young Joseph, restless and bored with farming, heard of the rich gold diggings in California. In 1849 he ventured westward with two of his brothers, seeking adventure and fortune. But contrary to the motivation that inspired most men moving West at the time, it was business opportunities rather than mining that attracted Gray. He first went to Texas, purchased a herd of cattle, drove them to California and sold them at a high profit. He then purchased a quarter section of land on the Old Auburn Road at Sylvan, in Center Township, Sacramento County, and later became the proprietor of the “Fourteen Mile House,” a station and inn located in the present day town of Citrus Heights. Joseph Gray settled there with his wife, Ann, and three daughters, Annie, Georgiana, and Nellie. Gray became a successful businessman, both in buying and selling cattle and in the drayage business. He met and became friends with Charles Crocker, one of the railroad’s “Big Four,” whom he considered “his partner.” Perhaps it was from Crocker that he learned the proposed route of the Central Pacific over Donner Pass and decided that better opportunities might await him in that area. When Gray first visited the present-day Truckee area in the late 1850s, he and two other men constructed a cabin on his 640 acres along the Truckee River. Soon after, Gray and his family moved in. When the railroad surveyors arrived, Gray’s 640 acres of land were confiscated. Resenting this seizure, Gray took the appropriate legal steps and, by 1864, re-acquired most of his land. Interestingly, the only recorded Nevada County deed reflecting the transaction is dated August 16, 1864 from S. W. McDonald to Joseph Gray consisting of two quarter sections of land and improvements on the Dutch Flat-Donner Lake Wagon Road. The sole consideration of all this land was a mere $200. There is no record as to the identity of who S. W. McDonald was or how he became involved. It took years for Gray to finally gain clear title to the land that became the town of Truckee. When Gray and his family eventually settled into their two-story log home, family life flourished. Ann cooked large meals of beef, lamb or venison for her family and the cowboys. Joseph loved dogs and there were usually from 15 to 20 canines whose job it was to chase badgers and coyotes. In the wintertime these four-legged companions also served as sled dogs. Business was good. Gray owned several freight teams, sixteen or eighteen mules, four to six horses and a number of wagons. His teams hauled freight from Grass Valley to Virginia City and the Gold Hill Districts. Huge supplies were stored near the cabin for winter consumption. Gray’s Station, as it existed at the time, encompassed the entirety of the present downtown district of Truckee. Most of the area was a fenced corral. 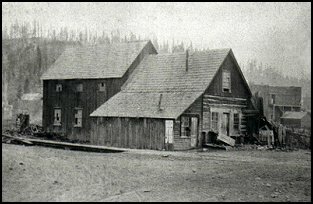 Next to his cabin, Gray built a horse stable and blacksmith shop; the stable was located on the land that is now Truckee’s downtown post office. Gray made many trips east to buy cattle. Assisted by his crew of youthful cowboys, he drove his herd across the plains. The beef cattle were slated to feed the thousands of hungry railroad construction crews that, by mid 1866, were struggling toward Donner Summit. During Gray’s long trips from home, his wife capably managed the station. As the railroad approached, a man named S.S. Coburn purchased land to the west of Gray’s Station and built another depot which grew into a larger settlement called Coburn’s Station. About the same time, Joseph Gray met lumberman George Schaffer. The two men recognized the need to supply lumber to the Central Pacific and the Comstock Lode and formed a partnership to build Truckee’s first sawmill, located across the river from town. On June 8, 1868, Joseph Gray and his family joined the cheering crowds as the first eastbound locomotive slowly chugged its way through the settlement. By now the community included a large number of permanent homes, two churches, a school, several hotels, and a myriad of saloons, Central Pacific roundhouses and a flamboyant red light district. When Coburn’s Station burned down a month later, Gray sold portions of his land along the railroad to a number of entrepreneurs who built the present town, now called Truckee. Notable townsmen such as John Kaiser, Frank Burckhalter, Stuart McKay and Elle Ellen were among the new arrivals. Almost overnight, the new town emerged just east of the rubble of Coburn’s Station. 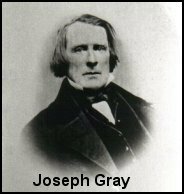 On November 8, 1868, the Grays were blessed with their first son, Joseph Henry Gray II, whose proud father named him after himself. Joseph Jr. became the first white child born in the new town of Truckee. Prosperity created recognition for the ambitious pioneer; Gray became a familiar face in town and was affectionately called Uncle Joe. His children played, grew up and went to school in the bustling little town and soon the family moved to a newer and larger residence on Church Street. Seeking new opportunities, Gray sold his interest in the lumber mill to Schaffer and hired large numbers of Chinese to cut cordwood for the railroads and to fuel the stoves of the growing town. Gray’s business ventures branched out. He opened the American House Hotel. In 1875, he became president of the Peoples Ice Company located at Camp 20 east of town where he also owned and operated a sawmill. In the early 1880s, Gray purchased the old Cadwalder Mansion at 720 N Street in Sacramento and moved there with his family. Perhaps the move was instigated because the severe Sierra winters were becoming difficult, or it may have been because he didn’t agree with the town’s growing sentiment to expel Truckee’s Chinese population. He remained in Sacramento, making frequent visits to Truckee. Joseph Gray Sr. passed away on August 6, 1897 at age seventy-one. His widow, Ann, lived until 1909. They are both interred at the I.O.O.F. Cemetery in Sacramento. But the story of the Gray family did not end with the passing of “Uncle Joe”. Joseph Henry Gray II moved to Reno, Nevada and became a successful partner in the Gray, Reid & Wright Department Store that existed until 1970. A registered historical place and beautifully preserved, his huge mansion, which still stands at 457 Court Street, now houses professional offices. Georgiana Gray married George E. Bullfinch, who served as principal of Truckee’s school and also as general manager of the Union Ice Company. They raised nine children. Annie Gray married John Rodda; they had three children and resided in San Francisco. Nellie Gray married Andrew Carlaw and lived in Sacramento. Joseph Gray III, along with John K. Koeneman and Harold G. Laub, became one of the founding partners of Southwest Gas Company of California, Nevada and Arizona. Gray’s cabin served as a copper shop and was later donated by D. J. Smith to the Native Sons and Native Daughters of the Golden West, Donner Parlor #162 who used it as a meeting hall. In 1912 the Native Sons moved the cabin to its present location at 10030 Church Street, west of the Recreation and Park District. The land for the new site was obtained from William Englehart, Sr. Standing on the site of Gray’s Station is the Stone Garage, now occupied by Sierra Mountaineer. A portion of the old livery stable is said to form part of the newer building’s wall. Below the paved parking lot is what was once the corral. Reconstruction and restoration required taking the entire building down, piece by piece, and putting it up again on an alternate site. A new roof was needed while rafters, floor and ceiling joists from the old building were adapted to form an ante-room portico. In the 1950s, the aging building was, again, extensively remodeled by Bill and Irene Englehart who used the cabin as their residence. More recently, a larger addition was added to the rear of the building and the entire structure was improved to meet current building codes. Despite the many fires which razed the town, the ceaseless construction of roads, freeways and commercial developments, winter storms and a continuous barrage of occupants, the old log house still stands today. The structure exemplifies a memorial to Joseph Gray’s accurate, prophetic vision. It is a tribute not only to Truckee’s past, but also to the future of a town steeped in history and to its citizens who have accepted progress while still embracing the pioneer spirit and determination of the town’s founder, Joseph Gray.